Tickets:£31.00 – sold out ! 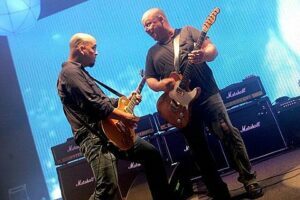 Formed in Boston, Massachusetts in 1986, legendary alternative rock noise-poppers the Pixies are playing Glasgow’s Barrowland on the 22nd November 2013. The cult rock band Pixies have announced details of the first leg of their new worldwide tour, which represents their first live concert series in nearly two years. The Pixies are playing just three gigs in the UK and Glasgow will be the bands only Scottish date. Don’t miss your chance to see this brilliant and unique gig! They recently released Bagboy, their first new song in almost a decade, and will be performing brand new material during their upcoming tour. The Pixies found only modest success in their home country, but were significantly more successful in the United Kingdom and elsewhere in Europe. Despite this, they never achieved mainstream success with their studio albums. The group is widely considered one of the most influential bands who didn’t achieve mainstream success in their prime. They are seen as an immediate forebearer of the alternative rock boom of the 1990s, though they disbanded into 1993 before reaping any of the benefits this might have brought them. Heavily influenced by punk and surf rock, the Pixies music is highly melodic, yet tremendously abrasive at the same time. Debut album Surfer Rosa, breakthrough Doolittle and successful follow ups Bossanova and Trompe Le Monde have left the Pixies with an impeccable back catalogue.